Served as a main dish or an appetizer, these chicken skewers are amped up with a spicy-sweet pineapple lime marinade. Serve over mixed greens or a bed of rice for a light supper. This is a perfect post-workout meal too, providing all the carbs, fats, and proteins that you need to recover. Pulse the pineapple in a food processor or blender until it has a smooth consistency. Add the lime juice, chile powder, salt and olive oil and process to combine. Pour marinade into a one gallon zip-top bag. ​Pierce the chicken breast with a fork in various places across the surface to ensure marinade absorption. Cube the chicken into 1-inch pieces. Add the chicken to the zip-top bag and let it marinate in the refrigerator for 1 to 2 hours. In a medium saucepan, cover the potatoes with water and bring them to a boil over medium heat. Reduce the heat and simmer until the potatoes are fork tender. Remove smaller potatoes from the pot as needed so they do not overcook. Mushy potatoes will be difficult to keep on the skewers. Once chicken is marinated, position an oven rack so that the skewers will be about 3 inches below the broiling element. Preheat the broiler. Cover a broiling pan with tin foil and spray with oil. Using a fork, poke a few small holes through the foil to allow for some drainage. Alternatively, place a cooling rack over a foil-lined baking sheet for a makeshift broiling pan. Cut the boiled potatoes and peppers into 1-inch cubes or pieces. 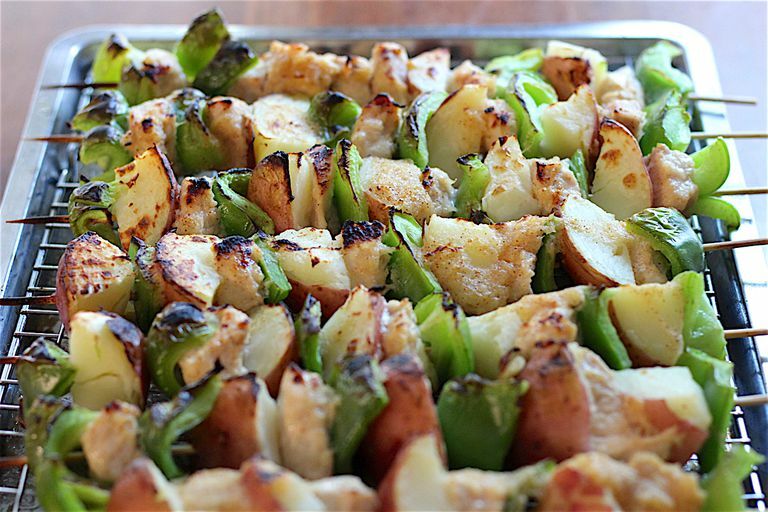 Thread the potatoes, peppers, and chicken onto the skewers and place them on the broiling pan. Brush the skewers with some of the marinade. Place under the broiler for about 10 minutes, until the peppers are charred and the chicken appears to be about half done. Flip the skewers over, brush them with the rest of the marinade and broil for 6 to 8 more minutes, until the green peppers are charred and chicken is thoroughly cooked. Red and yellow peppers can be used instead of green bell peppers. Canned pineapple can be used in place of fresh pineapple. If you’re using wooden skewers, soak them in water before use so they don’t burn in the oven. Marinate your chicken for up to 24 hours. Longer marinating time will increase the flavor penetration. These skewers can be grilled instead of broiled.